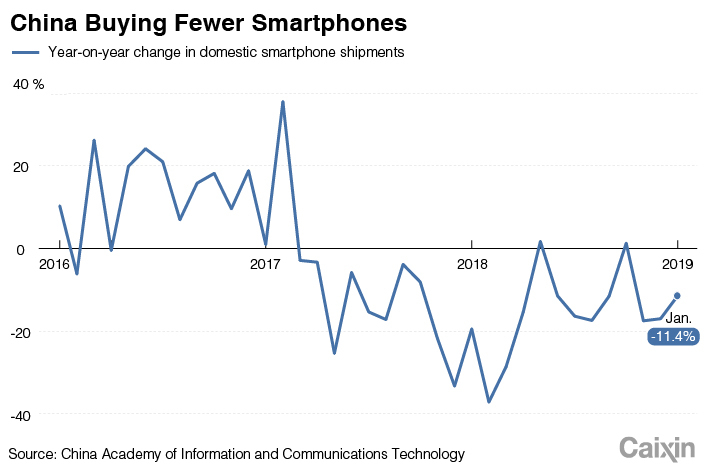 Smartphone-makers shipped 32.35 million units in the first month of 2019, the lowest figure since September 2018 and down 11.4% from a year earlier, according to a report published Thursday from the China Academy of Information and Communications Technology (CAICT). Though overall shipments were weak, Chinese companies are holding up better than their foreign counterparts. Domestic brands made up 94.2% of the total, compared with 84.4% in October. 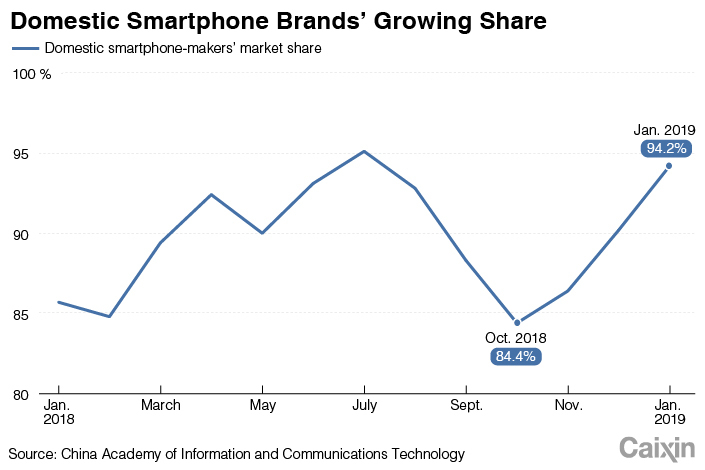 As the CAICT data shows domestic smartphone vendors seized more of the market in January and Android phones made up a greater share of the market — up to 93.2% from 89.3% the month before — it is clear Apple is having a tough time. In order to boost sales, the prices of some iPhone models have been reduced. China’s biggest e-commerce platforms including JD.com and Alibaba’s Tmall cut iPhone prices by as much as 1,500 yuan ($220) in January. The data released by CAICT didn’t break down shipments by brand, and Apple hasn’t released any data about its January shipments yet, though an industry analyst told Caixin that sales of the iPhone 8 rose significantly during the recent holiday.